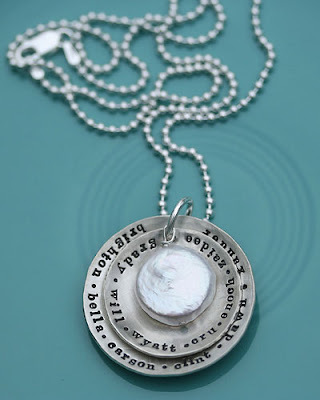 The Vintage Pearl creates unique and meaningful handstamped jewelry and keepsakes. Each piece is handcrafted from start to finish with care in our studio in Tulsa, Oklahoma. We use raw sterling silver, freshwater pearls and birthstone crystals in our creations. Each letter is individually stamped by hand, we do not use a machine, making every piece a true one-of-a-kind! Our jewelry is customized with any names, dates or words of inspiration, and we have several fonts and charm shapes to choose from. We want your piece to be meaningful to you. We have many unique designs and come out with new designs often. You can also "design your own" handstamped necklace by picking your favorite shapes and fonts with our eclectic necklace and our dainty eclectic necklace! 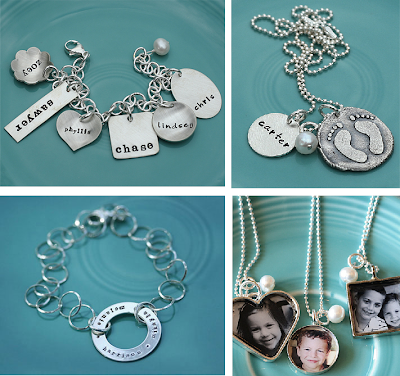 We create handstamped necklaces, bracelets, keychains, leather cuffs, earrings, dog tags, baby spoons and more~ the perfect gift for everyone! My children are my world...... and I feel so incredibly blessed to be a mom. For a long time I've been on the lookout for a unique piece of jewlry that I could customize with my children's names, though I could never really find something that fit my tastes......that is until I ran across the gorgeous creations from The Vintage Pearl! 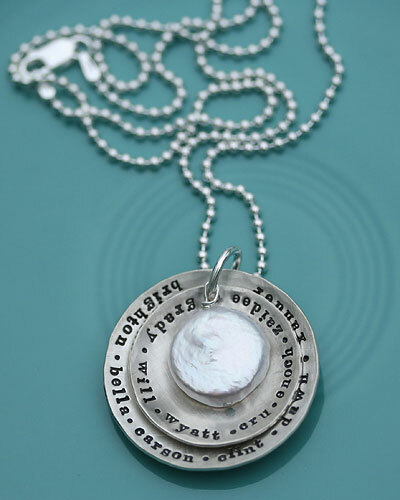 With a large selection of customizable jewelry and keepsakes, the Layered Mother of Pearl Necklace (pictured above) immediately caught my eye. The Vintage Pearl was very kind in working with me to not only customize the first disk with my children's names, they also stamped a personal message on the second disk; "........the sunshine in my soul". If you know me well, you know I have often referred to my little one's as "the sunshine in my soul" so it was incredibly wonderful and special when they were able to customize the piece with both their names and the quote! I was blown away by the friendly service and fast delivery of my beautiful necklace, it's simply stunning in person (the mother of pearl is so pretty and adds the perfect touch). The Layered Mother of Pearl Necklace is now one of my most treasured pieces of jewelry. I have to add that I LOVE the way that they package the jewerly (arriving in a beautiful box with a signature robins egg blue ribbon, adorned with a pearl and monogramed silver charm )....it's gift ready upon arrival! They also go the extra mile including care instructions, and a jewelry cleaning cloth......the little touches were very appreciated (I love to shop at establishment's that clearly appreciate their customers, don't you?!). The Vintage Pearl offer's gorgeous jewelry and keepsakes that are sure to be treasured for a lifetime!